When Casie moved into the little house on the farm there was an old grape barber that had fallen down. So it was time to fix if up and be sure that the grapes could grow well again. Into a beautiful grape barber in a couple of hours. The old grapes had a ground hog hole that also had to be filled in. We slowly picked through and took all the dead out and cut the new all back to where we could let it regrow. We then dug the holes to put a treated 4×4 post on each side of the grapes. We choose to place it far enough from each side to allow adequate growth. The holes were dug about 2 feet to prevent shifting from mud. This is below the frost line of the dirt. Once both post were secured in the ground and the ground packed around each, we placed 2×6 boards acrossed each post to make a T shape. 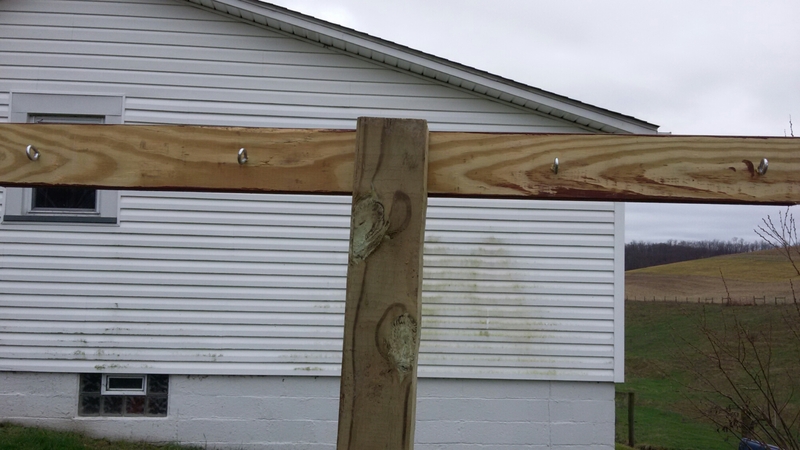 We then placed 4 eye hooks on each of these boards. Then the 3/8th cable was strung from one eye hook to the other until it connected each post. We left some slack in the cable to prevent the grape vines weight from pulling the eye hooks out of the boards before we secured each cable end. We cleaned the dirt up with the grapes and we were done until the grapes begin to grow. Then we will help guide the vines where we want them to go.